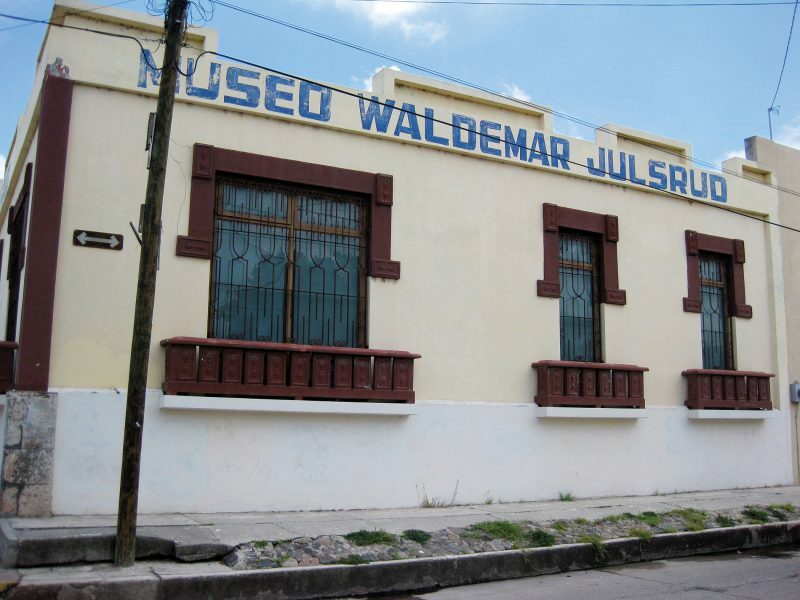 The Museo Waldemar Julsrud, in Acámbaro, Guanajuato, Mexico. Photograph by Avi Davis. The Museo Waldemar Julsrud squatted on the edge of town. Looking past it, you could see the end of the road and beyond that the green hills of Guanajuato State. Charles Hapgood must not have spent much time in central Mexico back in the 1960s, when he wrote that this area was arid and eroded—any spot that’s brown in the spring heat is sure to be green in the rains of summer. The museum looked to be an exception. Its stucco walls were the color of weathered bone, and its blue lettering, which could have been copied from the cover of an old Arthur C. Clarke paperback, was faded and spotty. The place might have been five years old or fifty. 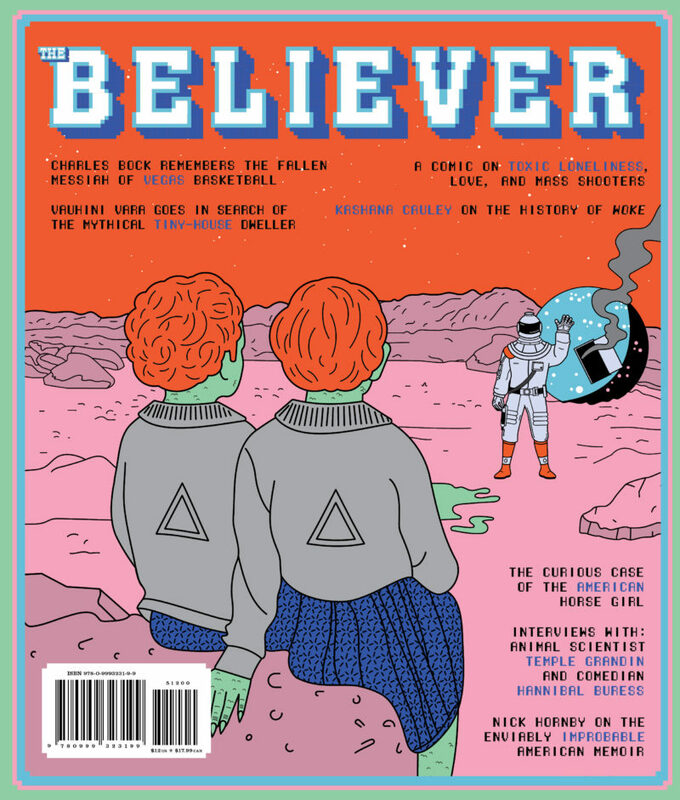 One thing was for certain, it didn’t seem inclined to reveal any secrets about the age of the weird figures housed inside —­ a collection of strange clay statuettes whose authenticity had been debated for half a century by pseudo­scientists, amateur archaeologists, and investigators of the paranormal. I looked at my two traveling companions, Luis and Oliver. “Here it is,” I said to them. “The home of Waldemar Julsrud’s lost world in clay.” Their faces gave no indications of their thoughts. I had invited Oliver to take part in this investigation because of his logistical skills and diplomatic connections; Luis, for his psychological training and knowledge of pre-­Columbian art. Also because they spoke Spanish. 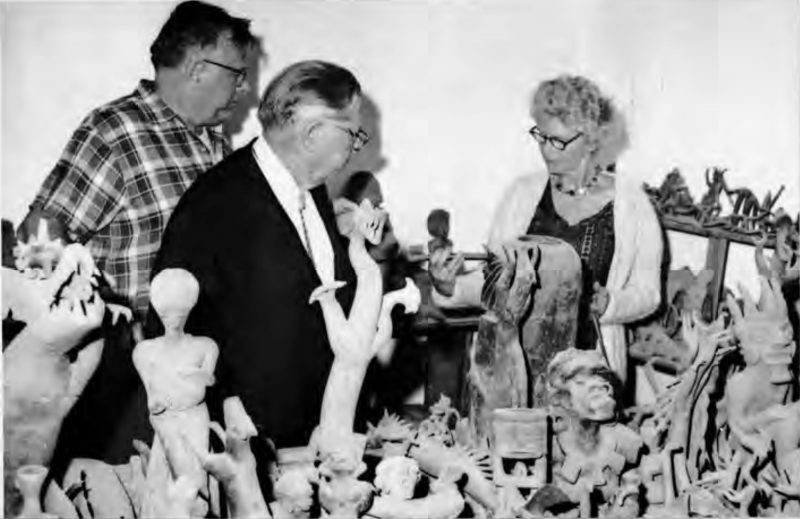 Professor Charles Hapgood, Erle Stanley Gardner, and Margaret Regler inspect the collection, 1968. From Host with the Big Hat, by Erle Stanley Gardner. “These are all fake?” Oliver asked, bending over one of the glass cases. The small cases that ringed the few cramped exhibit rooms of the museum stood at waist height. Apparently, comfortable viewing of their contents was impossible. Inside were the baffling clay pieces to which Waldemar Julsrud had devoted twenty years of his life. “I don’t think they all are,” I said, speaking in a low voice. The place was nearly empty, but the museum’s sole attendant, a saggy, middle-­aged man, had been trailing us suspiciously since we paid our ten-peso admission. The clay figurines in the first case looked genuine. Luis pointed out the trademark style of the Chu­pícuaro Indians, who occupied the Acámbaro area as early as 400 B.C.E. : Stylized human figures, only about five inches tall, they had flat bodies, rounded feet, and oversize heads, like gingerbread men. They were ornamented with diagonal scoring and fine braids. Their eyes resembled narrow, slanting coffee beans. They had a mischievous look to them. We’d know the fakes when we saw them, I decided. There were a few more cases of Chupícuaro bowls, pipes, and pitchers—elegant, functional pieces with geometric designs and a unified style. Then there was a strange and sudden development. First came figurines of women with conical breasts and Medusa-like hair. Then there were men with bat ears, and men with hammer heads. There were what looked like little clay-colored men from Mars. There were giant apes who howled at the viewer. In the next room there were clay renderings of sarcophagi, some of them three feet long, that bore an uncanny resemblance to the ones in the Egyptian wing of the Met. Next to these were Minoan-style ­human figures covered in thin parallel lines, with arms shaped liked bird wings. There were horses and camels. I tried to follow the explanations in Spanish on the typed index cards inside the cases: something about antedi­luvian animals, the possible influence of extraterrestrials, and the ancient, unidentified cultura Waldemar. Then we arrived at the last and largest room. Here was what we had really come for: the dinosaur statues. A few hundred must have been in that one room. Most of the clay figurines were just a few inches tall, but some measured three feet. There were dinosaurs with crested backs, dinosaurs with ridged backs, dinosaurs with spiked backs, dinosaurs with wings, dinosaurs with two legs, dinosaurs with three legs, dinosaurs on their hind legs, dinosaurs with dog faces, dino­saurs with duck faces, dinosaurs with gargoyle faces. Flat dinosaurs, round dinosaurs, dimpled dinosaurs. There were dinosaurs eating humans. There were dinosaurs standing alongside humans. There were dinosaurs with humans mounted on their backs, and dinosaurs being caressed by humans. The collection was overwhelming. And this was only a fraction of the vast assembly that Waldemar Julsrud had discovered here in this little central ­Mexican town nearly seventy years ago. But most of the pieces were crude, even childlike. There was no style, no system to them. On the walls of the exhibit room were mounted some photographs of old Julsrud himself. Here was Waldemar as a child in Germany. Here he was during his army service. Here he was jumping a horse in smart equestrian costume. I pulled out my digital camera. “Are you going to put those pictures on the Internet?” someone asked me in Spanish. I looked up. The museum attendant was smiling at me blandly. I had taken a few pictures of the museum as I went along, without thinking. “No,” I said, which was true. Suddenly I faced a barrage of questions from the attendant, all delivered in a limp, insipid tone. We could not take pictures, he announced. Where were we from? What did we study? Where did we learn about the museum? I tried to fend him off with some harmless inquiries about the museum in my primitive Spanish, but he ignored them. The man was obviously very nervous about our presence. Luis and Oliver attempted their own defense, but the attendant persisted. How old were we? Which part of Mexico City did we live in? Something was not right. We fled the museum. At a dirty cantina in the center of Acámbaro, we reviewed the situation. The facts were as follows. One day in 1945, or possibly 1944, Waldemar Julsrud, an elderly German, or possibly German Norwegian, hardware merchant and amateur archaeologist who lived in Acámbaro, was riding his horse, or hiking, on a hill just outside of town. He spotted something on the ground that was either partially buried or lying in a ditch, and extracted it therefrom. The small clay figure didn’t seem to belong to any of the ­local Indian cultures with which Julsrud was familiar. Back at home, he showed the artifact to one of his employees, or assistants, a man named Odilón Tinajero. Tinajero was a local farmer. Or just a laborer. Julsrud offered to pay him one peso for every piece like this one that he could bring back, if it was unbroken. A few days later, Tinajero brought back a whole wheelbarrow of them. Soon he was bringing dozens every week. Sometimes other villagers from Acámbaro would bring figurines to Tinajero, who would then sell them to Julsrud. Eventually Julsrud amassed thirty-two thousand pieces, or thirty-seven thousand, and his house overflowed with them. The German amateur archaeologist was astonished by the variety and complete novelty of the artifacts, and even more astonished by their seemingly impossible depiction of exotic animals, ancient Mediterranean cultures, and Mesozoic reptiles. To Julsrud, the collection proved the existence of a previously unknown pre-Hispanic culture that had lived alongside dino­saurs in Mexico 100 million years ago. Or it proved that dinosaurs were alive in Mexico ­until only a few thousand years ago and had lived alongside a previously unknown pre-Hispanic culture. It was a confusing case. Many experts had looked into it since the 1940s, and as a result the reports were contradictory. Within a few years of the discovery, Julsrud was trying to call the press’s attention to his uncanny artifacts, which, he was convinced, would precipitate a complete revision of natural history. At first he was ignored. His theories were too wild. He thought the artifacts were “Atlantean,” remnants of a lost continent. Then came the first hesitant step toward credibility: American journalists began to cover the story. 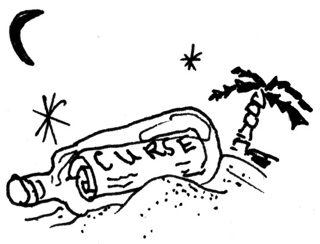 The Los Angeles Times published an article in 1951, and others soon followed. As the cultura Waldemar gained notoriety, a young anthropologist, archaeologist, and expert on Mesoamerican culture from Arizona named Charles Di Peso decided to make the first scientific investigation of the collection. He traveled to Acámbaro, inspected the pieces, and observed one of Tinajero’s excavations. The figurines were patently false, as he concluded in his article for American Antiquity in April 1953. The mere number of complete pieces was improbable for a single archeological site. And the Julsrud pieces were not only complete, they were immaculate. They showed no signs of the patina, wear, or packed earth that inevitably forms on objects buried for centuries. Di Peso also noted that the ground from which they were “excavated” had clearly been dug up and re-packed, as it showed a mix of red and black earth of different ages instead of the strata that would be found in a true archaeological site. In 1954, Mexico’s Instituto Nacional de Antropología e Historia made its own inquiry, with similar findings: the pieces were fakes. Strangely, though these authoritative reports shed a great deal of light on the clay menagerie, they only kindled the growing debate around it. Julsrud ignored the adversarial findings and clung to the belief that the revolutionary significance of his figures would one day be realized. In 1955, a decade after the dis­covery of the first piece, a history professor named Charles Hapgood from Keene State College in New Hampshire began what was to become the most lengthy—and perhaps most influential—study of the cultura Waldemar. Hapgood, a dough-faced man with a senator’s haircut and browline glasses, visited Acámbaro twice, scrutinized the collection, interviewed Julsrud and Tinajero, consulted with various authorities, performed independent digs, and compared the figurines to the art of other pre-Hispanic cultures. In 1973, Hapgood published a small book called Mystery in Acámbaro. He wrote that although he had originally been a skeptic, he was now convinced that the Acámbaro figures could not have been faked. Rather, they were the production of an ancient people who lived without knowledge of agriculture, the bow and arrow, or human burial, but who were prolific producers of ceramic art, and who enjoyed a connection with animals lost to modern civilization. In fact, he wrote, the cultura Waldemar was the seminal culture from which every pre-Hispanic civilization descended, and may have been the mother culture of the human race. Hapgood’s investigation brought the most visibility to the case thus far, and it had far-­reaching consequences. Another researcher, John Tierney, asserted that Julsrud and the Acámbaro figures were the victims of a Smithsonian Institution disinformation campaign. In the meantime, while Hapgood was writing his book, the Penn Museum used a new method called thermoluminescence sampling to try to establish the true age of the artifacts. Initial tests showed the figures to be several thousand years old, but later trials proved the method to be unreliable. Waldemar Julsrud died in 1964, and Charles Hapgood was killed in a car accident in 1982, and for two decades the thirty thousand creatures of the cultura Waldemar languished in Acámbaro untended. But as the twentieth century drew to a close, a group of Young Earth Creationists from the United States, relying heavily on Hapgood’s conclusions, latched on to the Acámbaro figures as undeniable evidence against the theory of evolution. The debate over Julsrud’s lost world was reignited, and finally, in 2002, Acámbaro opened the Museo Waldemar Julsrud. “But didn’t you say they were all made in the bakeries?” Luis asked. “I didn’t say it,” I said. “Pablo Helguera said it.” Pablo Helguera is a Mexican artist and educator who now works at the Museum of Modern Art in New York City. I had first heard of the Julsrud figures from a talk he gave at Mexico­ City’s modern art museum in April, where he was promoting his new book, What in the World. Helguera pointed out that Acámbaro is full of panificadoras, bakeries with huge ovens that date from before World War II. Acámbaro’s bread is famous throughout Mexico. The thousands of clay figures that Waldemar Julsrud bought from Tinajero could easily have been fired in the ovens of the panificadoras, alongside the hundreds of loaves that were baked every day. We had seen the bakeries as soon as we arrived in town that morning, and discovered one just around the corner from the cantina. It stood open to the street, shelf after shelf lined with the big, teardrop-­shaped loaves of the pan grande de Acámbaro, whose surface is decorated with diag­onal slashes or thin braids down the middle. Looking at the design, I was reminded of the smug little Chupícuaro figurines, probably the only genuine artifacts in Waldemar Julsrud’s museum. The fact was, I had already decided that Julsrud’s creatures were fake. The one peso that Julsrud offered Tinajero for every complete piece he found—no insignificant sum at a time when Mexico’s minimum wage was ten pesos per month—had been the motive to forge the artifacts. In Acámbaro’s bakeries, Pablo Helguera had found the method. This was no science-fiction story. Nothing impossible or even fantastical had happened. For me, the question was how it had all happened, and why. Where did an uneducated Mexican laborer come up with dinosaurs, camels, martians, and Egyptians? How had a sophisticated German fallen for it? Why did an American professor think he had found the cradle­ of civilization in central Mexico? And why did the Acámbarans make a museum for it all? Charles Hapgood’s faith in the figurines’ authenticity rested on some pretty tenuous claims: the delicate clay pieces were intact, he wrote, because they had been carefully buried as a sacred collection, to protect them from the Spanish; they showed no signs of aging because they were submerged in the sandy beach of a lake that once occupied the site of Acámbaro; they resembled those of no other Indian culture because they predated all known cultures. One of his assertions was very straightforward, though, and seemed a case-closer: Odilón Tinajero, Julsrud’s uneducated assistant, who could barely read or write, was simply too ignorant to know what a dinosaur looked like, let alone to be able to sculpt one. But Hapgood made a mistake in measuring the Acámbaro villagers by his own standards of education. In the first half of the twentieth century, Mexicans consumed huge amounts of nonliterary media, mostly in the form of movies and comic books. By 1940, the average family went to the movies several times a month, while over half a million comic books were sold ­every day. 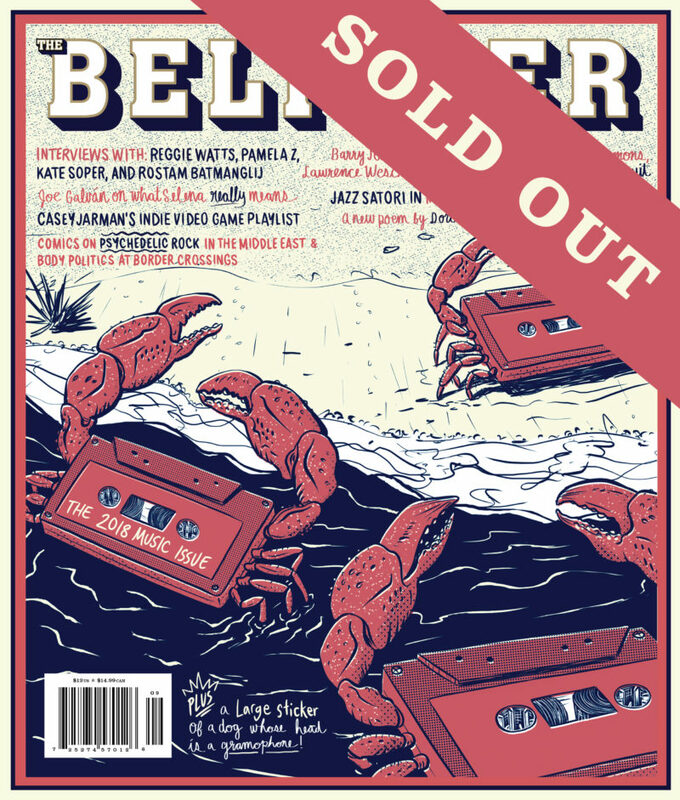 And as Mexico entered a consumerist “Golden Age” in 1940, it became increasingly connected with U.S. pop culture, where dinosaurs had abounded since the 1920s. Anyone who had watched The Lost World (1925), King Kong, or The Son of Kong (both 1933) would have been familiar with long-necked, four-legged sauropods like the brontosaurus and the brachiosaurus—which happened to be the only genuses Hapgood was able to positively identify among the thousands of dinosaur representations in the Julsrud collection. Anyone who had seen Flash Gordon, one of the most popular comic strips of the 1930s, could regularly find its hero on the planet Mongo battling alien creatures that looked suspiciously like stegosauruses or plesiosauruses. In the mid-1940s, Superman confronted a reanimated dinosaur in a cartoon short, while Batman and Robin landed on Dinosaur Island in an issue of Batman. And any Mexican who had driven through a gas station operated by Sinclair Oil—one of the largest oil companies in the U.S. in the first half of the twentieth century, with refineries throughout Mexico—would have known Dino, a stylized brontosaurus that Sinclair adopted as a logo in 1930. Sinclair filling stations displayed rubber dinosaur models next to their pumps, and children were given inflatable Dino dolls as promotional items. Though travel between the U.S. and Mexico was common by the 1940s, the Acámbaro forgers had plenty of inspiration south of the border. Mexico’s homegrown comic books, or historietas, were encyclopedias of the exotic, fan­tastical, and prehistoric that even the poorest, least educated Mexican had access to. In the mid-1930s, as the Sunday comics pages of Mexican newspapers devolved into a swamp of syndicated American strips, historietas emerged and soon provided a flourishing ­habitat for Mexican comics. In the decades before television, in a ­country where half the population was illiterate, comic books became not just a ubiquitous source of entertainment but something like a national pastime. Each book featured at least a dozen individual strips, a few of them translated reprints of American comics, but most wholly original creations. Paquín materialized on the scene first, in 1934, followed by Paquito, in 1935, and Chamaco, in 1936. But the giant in this pulpy panorama was to be Pepín, also appearing in 1936, which grew so popular that many Mexicans came to refer to any comic book as a pepín. By 1938 Pepín was being published three times a week; in 1940 it went daily. Competition between historietas was fierce enough that Pepín’s rivals had do the same or face extinction. I was able to track down a few months’ worth of Pepínes from 1939, and as soon as I flipped through them I knew I had found the true origins of the Acámbaro figures. Julsrud’s menagerie turned out to be the clay manifestation of the comic book’s stranger inhabitants. Here was a malicious martian-like creature in the strip called “El Hombre y el Monstruo.” “Adelita y las Guerillas” featured a giant gorilla. Camels and Egyptian artifacts abounded in “Beiker,” a strip about an adventurer in a pith helmet, and “Fu-Manchu” produced still more ornamented sarcophagi. Griffins and dragons—sometimes ridden by knights—leaped across the pages of “Orlando Furioso,” while komodo dragons fought enormous pythons in “Corazón de Tigre.” But the ­final blow was “Piratas en Venus,” a swashbuckling space adventure that looked like a Mexican mutation of Flash Gordon, down to the “alien” dinosaurs and giant lizards that the hero encountered in nearly every installment. Mexican pop culture had fooled the German amateur archaeologist and the American professor. “What the hell was a German amateur archeologist doing in central Mexico in 1945?” Anne Rubenstein asked. Rubenstein is a professor of history at York University in Toronto, and the author Bad Language, Naked Ladies, and Other Threats to the Nation, the best book in English on comics in Mexico. I had written to her asking if she knew anything about Mexican comics that involved dinosaurs. It was not exactly the ­reply I had expected, but she made a good point. Waldemar Julsrud was a nebulous character who left a lot of questions unanswered when he died, in Léon, Mexico, in 1964. In some ways, his appearance in Mexico can be explained easily enough. He was born in Bremen in 1875. He was a hardware merchant, Mexico had a rapidly expanding industry but no merchant class, and Mexican dictator Porfirio Díaz was encouraging the “Europeanization” of his country. So in 1896 Julsrud found ­himself at home as one of many hardware merchants in Mexico City’s small but strong German enclave. He seemed to have lived a gentlemanly life there. He had his shop in the city. He was vice president of the Deutscher Reit Verein (German equestrian federation) in the Condesa neighborhood. In one of the photographs on the wall of the museum, he appears nattily dressed in a top hat and tails, standing on a balcony bedecked with flowers, next to Porfirio Díaz himself, although the occasion is not noted. The Mexican Revolution en­ded all that. Julsrud had moved to a hacienda outside of Mexico City and begun breeding horses. Revolutionaries took him hostage there and planned to execute him. The reasons are unclear: perhaps he had been too close to the Díaz dictatorship, or was simply a convenient relic of it. But Julsrud escaped and fled to the country by horseback. Seemingly by chance, he arrived in Acámbaro, and was able to ­settle down there without trouble. At the time, Acámbaro was developing as an important hub and repair facility for Mexico’s national railway—not a bad place for a displaced hardware merchant to find himself. Soon Julsrud had the largest business in town. That left the archaeology part. Julsrud was purely an amateur, and his knowledge seems to have been unorthodox to say the least. But in his archaeological dabbling he was also following—consciously, I think—a venerable tradition of German anthropological exploration in Latin America. Erwin Paul Dieseldorff—who was born in Hamburg but in 1888 moved to Guatemala, where he founded a significant coffee business—­researched the Mayan civilization in his area and collected important Indian artifacts. Karl Theodor Sapper, from Wittis­lingen, belonged to a family that also ran large coffee plantations in Guatemala, and worked with Dieseldorff on his research there. He also made geological studies in Mexico, and his work continues to be cited today. The first ethnological research on the tribes of Tierra del Fuego was performed in the 1910s and early 1920s by a German priest named Martin Gusinde. But by 1944, this era was long defunct. Julsrud’s archaeological adventure more closely resembles that of another twentieth-century would-be anthropologist, a physician named Dr. Javier Cabrera Darquea, who lived in the small town of Ica, Peru. 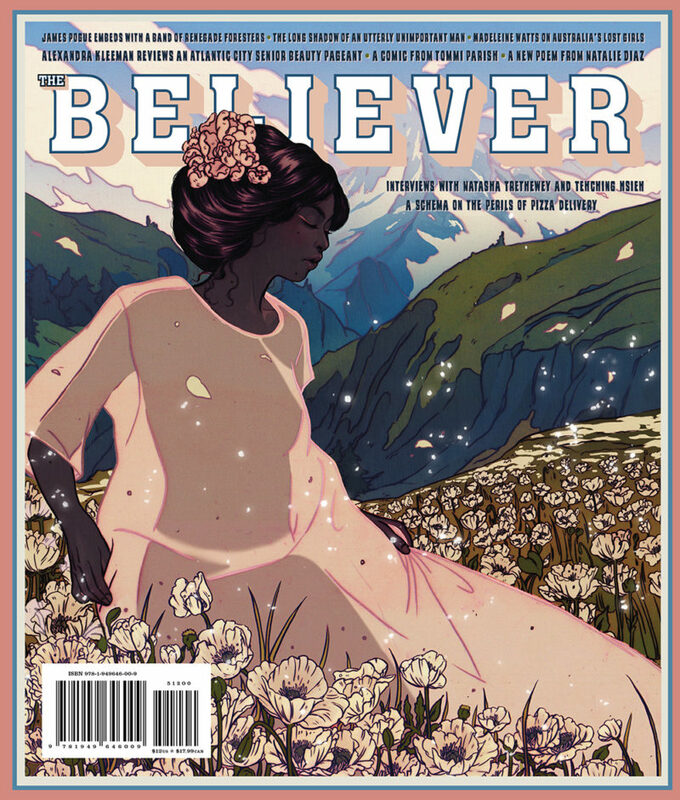 Cabrera’s story reads like an alternate version of the cultura Waldemar mystery. Like Julsrud, Cabrera was culturally a European foreigner—his father was a Spanish aristocrat—and also like Julsrud, he had no training in archaeology or anthropology. In 1966, a friend gave Cabrera a carved, spherical rock that resembled Indian artifacts the physician had seen before. Cabrera was intrigued by a carving he thought depicted an extinct fish. He offered to buy any similar pieces, and soon a local farmer was providing him with hundreds of carved stones, saying that he and other villagers had found them in a nearby cave. Many of them depicted dinosaur-like creatures, while in others Cab­rera detected what seemed to be the art of an ancient, advanced civilization with knowledge of telescopes, heart and brain surgery, and interplanetary travel. In a few years Cabrera had collected some fifteen thousand of these rock globes, and opened a museum for them. The Ica stones gained a fair amount of media attention, and after repeated interviews, the local farmer who supplied the stones admitted he had forged the artifacts because manufacturing them was easier and more profitable than working his fields. Despite this confession, the authenticity of the Ica stones continues to be supported by creationists, fringe scientists, and extraterrestrial enthusiasts. In both Acámbaro and Ica, canny locals profited from the fantasies that would-be European discoverers projected on the mysteries of pre-­Hispanic culture. Pablo Helguera argues that the cultura Waldemar would be better named the cultura Odilón. But in my view Julsrud wholly deserves to have these impossible items named after him—a rather different honor than that afforded to entomologists or zoologists who discover a new species. This culture in clay is one that belongs fully to the whims of Waldemar Julsrud. Odilón Tinajero may have created the impossible ceramic kingdom, but he entrusted it to Julsrud—the curator, the ­custodian—and gave him the Edenic choice between ignorance and immortality, or knowledge and mortality. The saga of the Acámbaro figures may not have been a science-fiction story, but at times it read like a pulpy mystery novel. In 1968, Charles Hapgood, who held a master’s degree in medieval history and an unfinished doctorate on French history—but had no training in archaeology or anthropology—invited the aging detective novelist Erle Stanley Gardner to join his second inspection of the Acámbaro puzzle as an expert in criminology. At the time of his death, in 1970, Gardner had been called America’s best-selling author. After giving up a career in law, Gardner went on to crank out some four hundred articles, twelve travel books, and one hundred twenty-seven novels, and earned fame for creating the wisecracking detective hero Perry ­Mason. But by his own admission he was “not really a writer at all”: he would dictate formulaic plots into a tape recorder and then split the writing between a team of secretaries. In his own account of the Acámbaro mystery, Gardner remained savvily ambivalent about the authenticity of the cultura Waldemar. But Hapgood, the unqualified anthropologist, eagerly counted this writer who couldn’t write among the supporters of the mock German archaeologist’s archeological discoveries. And Hapgood, it turned out, was spectacularly unqualified to lead an objective investigation of the Acámbaro figures. During his time as a professor, he became deeply involved with a psychic from rural Massachusetts named Elwood Babbitt, with whom he went on to write several books, such as Talks with Christ and His Teachers (1981) and The God Within (1982). Through sessions with Babbitt, Hapgood communicated with Albert Einstein and Sigmund Freud, among others, and was made aware that he had been Charles I of England in a former life. Hapgood’s faith in the medium arose from his belief that Babbitt, an uneducated farmer, could not have known about such historical figures except through the intervention of spirits. He had used the same argument to explain Odilón Tinajero’s inability to forge the Acámbaro figures. More important, Hapgood had an academic ax to grind when he arrived in Acámbaro, though that ax turned out to be made of Silly Putty. His investigation was sponsored by the Institute for the Study of Consciousness, begun in Philadelphia in 1952 by Arthur Young, designer of the first commercial helicopter, and his wife, Ruth Forbes, member of a wealthy Boston family and great-granddaughter of Ralph Waldo Emerson. Young established the foundation to pursue his interest in unexplained phenomena such as ESP and astrological predictions. There were rumors in the 1950s that he was in contact with the alien creator-gods of Egypt. The professor’s interest in lost civilizations had come to the fore during his first teaching job, at Springfield College, when a student’s question about the lost continent of Mu prompted Hapgood to lead a class investigation into the lost continent of Atlantis. Hapgood’s conclusions about the possibilities of dinosaurs surviving until a few thousand years ago and the cultura Waldemar being the mother civilization of the Americas became just another piece of evidence in his theories about radical continental shift and lost societies. From the beginning, I had thought the collaboration of the creationists and the people at the museum constituted an unholy alliance, so to speak. Now they wouldn’t talk, and their silence on the origins of the museum only deepened my suspicions. The mus­eum’s attendant had been unhelpful, to say the least. No one answered the repeated emails and phone calls I made after our visit. Attempts to contact the museum’s first director were unsuccessful. In desperation I went back to the museum, only to find it closed. I left a note under the door, but got no response. I thought the creationists would be eager to answer my questions. After all, they claimed the museum had been their idea from the beginning. 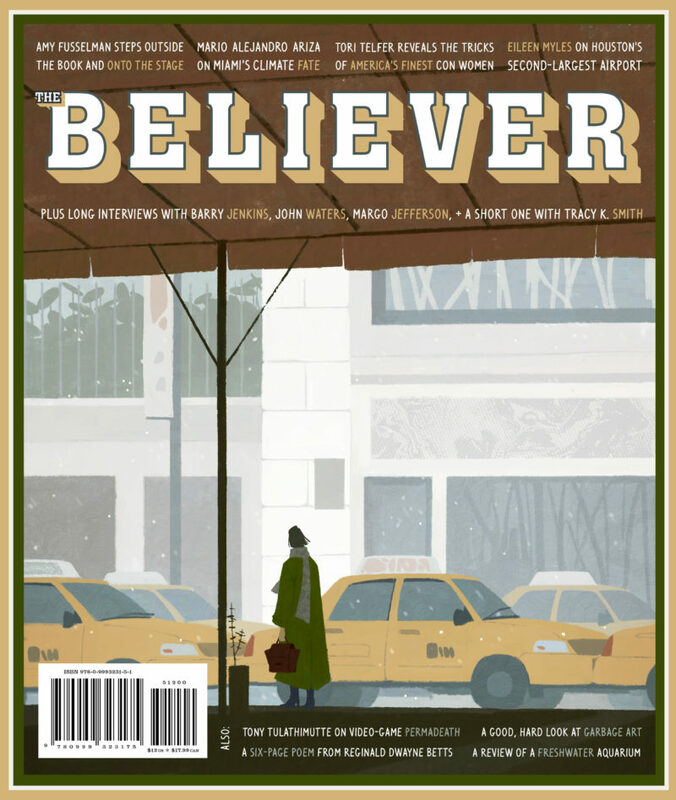 When Dr. Dennis Swift and Dr. Don Patton—two fundamentalist Christians who, between the two of them, could claim a few theology degrees and one unaccredited Ph.D. in education—­traveled to Acámbaro for the first time, in 1999, the collection had been kept out of the public eye, in a municipal storage building, for decades. Eventually, the two self-proclaimed dinosaur experts convinced the local government to allow them to examine the collection. They photographed the figurines extensively, claiming to identify representations of genuses like the iguanodon and the maiasaura along the way. Their coaxing began to attract media attention to the collection again, and soon the two doctors of divinity were handing out dinosaur T-shirts and meeting with the town’s mayor, the secretary of tourism, and representatives of the U.S. embassy, in an attempt to convince Acámbaro politicians that creating a museum for the Julsrud collection would do wonders for the town’s economy. The plan worked. The Museo Waldemar Julsrud opened in 2002. That’s the story on their website. But whom exactly did they convince? What had been the objections? Where did the funds come from? Apart from some vague statements about the incompetence of the people who run the museum, Dennis Swift ignored the questions I put to him in several emails. “The Acámbaro Julsrud Museum is clouded in corruption and the attempts of the Mexican government to marginalize the collection,” he wrote to me. “It was after substantial political pressure by myself, Don Patton, and Jack Breitler that the museum was built. The first curator was dismissed because of his helping us to document the collection.” Their progeny had already turned against them. Then I uncovered a strange coincidence, buried in offhand comments from a few online articles. A man named Heriberto Silva was one of the locals who backed the founding of the Museo Julsrud in 2002. On one level, this made practical sense: Silva was vice president of the Organization for Economic Development for the Region of Acámbaro, and the museum had been touted as a magnet for tourist dollars. But Silva’s role was also uncannily appropriate. The Silvas, an old Acámbaro family supposedly descended from Tarascan Indian royalty, originated the now-famous Acámbaro bread tradition. During the era of Nueva España, Don Abraham de Silva Cuín was the first to bring together the Franciscan secrets of bread-making with an indigenous talent for ceramics, which produced the ovens. In 1935, Don Abraham Silva López and his three sons, Heriberto, Carlos, and Samuel, all direct descendants of the original Don Abraham, founded the popular panificadora El Triunfo. The bakery continues to operate in Acámbaro today, under the direction of the same Heriberto Silva who helped establish the Julsrud museum. The fantastical clay statues that ended up in Julsrud’s collection may have been fired in the ovens of El Triunfo. The greatest irony of the Acámbaro figures, however, is that men like Hapgood, Swift, and Patton have refuted one type of very ordinary, human, repetitive creation in favor of a supernatural, divine, and unique creation. 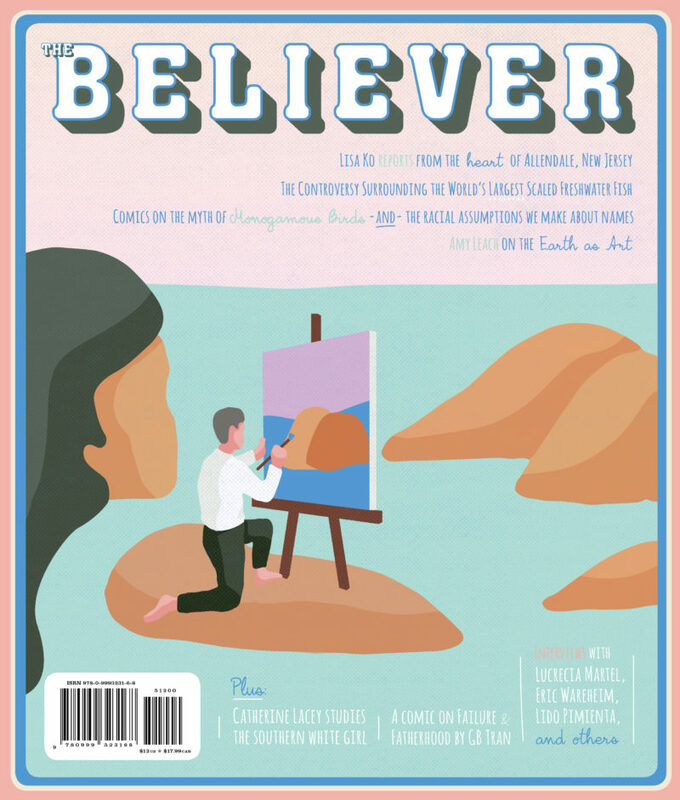 By insisting that Tinajero and the villagers could not have crafted the figures, these pious Christians deny the Mexicans their most human, and most godlike, attribute—the ability to create. We are all made in God’s image, but some of us, they seem to be saying, more so than others. Avi Davis is an American writer and content creator based in Paris. He has contributed to the Best American Travel Writing series, The Believer, Vice, France 24 and n+1.